VR Fitness Insider is always on the lookout for the best and most innovative VR games and technology that will help our readers and shape the VR Fitness movement. There were many brilliant nominees and finalists, but only one victor from each category can be awarded the VR Fitness Insider VR Fitness Awards 2017. BoxVR is a high-intensity, rhythm-based boxing workout that feels like a game. Get your sweat on and punch to the beat with heart pulsing electronica or train to your very own workout mix. FitXR is motivating VR gamers and fitness enthusiasts to drop the pounds and tighten up one punch at a time. Developed by a team of fitness instructors, it’s no wonder BoxVR is so effective at blasting away fat and building muscle. Congratulations on winning Best VR Fitness Game of the Year! Sparc has been coined as a rapid-fire vSport and is as close as it comes to dodgeball for VR. Compete and play between friends or with unknown challengers from around the world. Throw, block, dodge and maneuver your entire body to defeat your challenger. Don’t take any hits and protect your score by outplaying your opponent! With successful tournaments already under their belt, CCP has a high-quality competitive VR game on their hands. Congratulations on winning the Best VR Competitive Fitness Game of the Year! Going glove to glove with a trainer or with boxing champions from around the world makes The Thrill of the Fight an absolute must-have VR fitness game. When you’re face to face with Ugly Joe, you’ll see why this upper body workout made it to the top spot on our sports sim’s list. Jabs and uppercuts galore, Ian Fitz’s Thrill of the Fight shreds arms, shoulders, chest and back, but also works the obliques and abs when you turn to block. Congratulations on winning Best VR Sport SIM Fitness Game of the Year! As a high-caliber VR boxing game, BoxVR will motivate you to punch and jab your way to fitness while keeping track of your calorie burn and how long you’ve been sweating bullets. This trainer developed game understands the importance of keeping the fighter on their toes with amped up music and variety of challenging hit combos. With frequent updates and stage development seen during Halloween, FitXR is keeping BoxVR fresh and evolving. Congratulations on winning Best VR Boxing Fitness Game of the Year! The hard hitting combat in Sword Master VR leaves even the fittest gamer with noodle arms, as armored villains from hell try to kill you. With a sword to swing and stab at iron-clad opponents, being surrounded is not an if, but a when. Skipping the shield and relying on the legs to duck and escape decapitation made for an awesome lower body workout. VR fitness gamers will love that Master Indie designed the combat to be in 360-degrees — so watch your back! Congratulations on winning Best Fighting Fitness Game of the Year! As a first person shooter, Superhot, made our legs, abs, and arms burn with their famous time slowing gameplay. Options to sucker punch, slice, and shoot ember red polygonal humanoids across action-packed stages gave us a workout like no other. The Superhot Team’s Endless Mode gave us hours of entertainment and exercise, or two major reasons why they took the top spot. The Superhot Team’s focus to keep creating new game additions is the cherry on top of an already great game. Congratulations on winning Best VR Shooting Fitness Game of the Year! Getting to our happy place has never been easier, thanks to Guided Meditation VR. With over 17 peace inducing environments, weekend warriors and fitness enthusiasts chilled out and lowered their stress. 50 guided sessions taught meditators how to escape the hectic world and find solace within themselves. Placed in realistic locations like a tropical beach or in a far out crystal cave, Cubicle Ninja helped tame meditators with an active mind and body. Congratulations on winning Best VR Meditation Game of the Year! Like Dance Dance Revolution for the fists, BoxVR brought rhythm boxing to our VR headsets — boy did we sweat! With overlays that made us uppercut, jab, and hook to the beat of the music, it’s clear why Box VR is the heavyweight champion of cardio. There’s no cheating or tapping to take the top spot on their leaderboard. FitXR developed fitness options like Train or Survive, so new and experienced fitness gamers will see real results. Congratulations on winning Best VR Cardio Fitness Game of the Year! Sprint Vector’s competitive arm blasting game had fit gamers across the nation sprinting past checkpoints and across the finish line. Pumping their arms and gaining speed boosts along the way, players raced past other challengers and top competitors found themselves vying for a spot at the Alienware VR Cup. With arm pumping mechanics to move inside the game, it’s no wonder why Survios’ Sprint Vector is the arm champion of VR fitness. Congratulations on winning Best VR Arm Workout Fitness Game of the Year! The PC-powered HTC Vive has the most expansive fitness gaming catalogue when compared to other major competitors. Their partnership with Valve and Steam gives major and independent publishers and developers a popular platform for VR gaming that reaches millions of VR users. The easy clean up, room-scale tracking, 110-degree field of view and the implementation of the Vive Tracker Pucks and their ability to turn objects into VR fitness tools is enough to call the HTC Vive the most versatile VR headset. Congratulations on winning the Best VR Headset For Fitness! The handy wireless Vive Tracking Pucks can be secured onto bats, fake swords, tables, and even onto pet vests. With The Vive’s vast gaming catalog, fit gamers have their pick for what their next workout will be, while the Tracking Pucks give them options for full body tracking and creative weapon choices. Ditching the controllers for Vive Trackers turns the body into a VR gaming controller, which has made gaming more exciting than ever before. 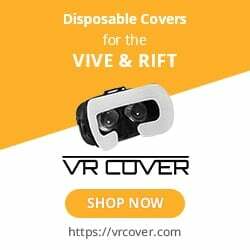 Congratulations on winning Best VR Accessories of the Year! Ryan DeLuca founded Bodybuilding.com in 1999 in his garage in Idaho at the age of 20. Under Ryan’s leadership, the company skyrocketed to nearly $500,000,000 in annual revenue before he stepped down as CEO in 2015. Ryan was temporarily retired for only six months before the startup bug bit him again and Black Box VR was born, merging his continued passions for technology and fitness and the way they can intersect to help people transform their lives. Preston is the Co-Founder & Chief Creative Officer at Black Box VR. Preston is a fitness fanatic, UXUI junkie, product design ninja and product visionary. Preston has provided creative direction and product management to some of the largest brands in the world. His passion for amazing products and solving difficult design problems has earned him numerous awards for projects ranging from traditional print campaigns and packaging design, to chart-topping mobile applications with complex information architectures. Shane Hoalst is Vice President of Digital Marketing at Black Box VR. He has over 15 years of experience in marketing and e-commerce. He spent a big part of his career at Bodybuilding.com and has a passion for fitness and technology. Duane With over 10 years as a creative director in the gaming, mobile app and print industries and 5 years at Intel as a software engineer and UX lead, Duane has a unique talent of translating abstract creative concepts into actionable, real-world results. His core competency is in bridging the gap between strategic, artistic and technical teams. He takes personal and career development very seriously and is always learning. Duane has lived an adventurous life across 27 countries, speaks 3 languages (English, Mandarin and Indonesian), is the recipient of a Gold Award at Chinese International Industrial Fair (CIIF) for Excellence in Robotics, and has an enthusiasm and zest for life that he bring to all the teams that he works with. Jim is the General Manager at Black Box VR and specializes in the creation, publishing and support of interactive products and services for digital platforms. His 17 years of game and interactive development experience includes production management, product design, publishing operations, strategic business development and studio operations management. While this may sound important, he is generally just a big nerd for all things geeky and fun. Tim Donahey is an NASM certified personal trainer, former competitive powerlifter, VR fitness enthusiast, and CEO of VR Fit. After more than 10 years in the fitness industry, Tim discovered firsthand the profound impact of using virtual reality as a tool for athleticism and embarked on a 50 day experiment to test the benefits of a purely VR based fitness lifestyle. The overwhelmingly positive results of his experiment lead Tim to found VR Fit where he develops and implements VR fitness solutions for people from all walks of life.